For other uses, see Cowgate (disambiguation). The Cowgate (Scots: The Cougait) is a street in Edinburgh, Scotland, located about 550 yards (500 m) southeast of Edinburgh Castle, within the city's World Heritage Site. The street is part of the lower level of Edinburgh's Old Town, which lies below the elevated streets of South Bridge and George IV Bridge. Consequently, the Cowgate can be quite gloomy and dark in sections. It meets the Grassmarket at its west end and Holyrood Road to the east. The street's name is recorded from 1428, in various spellings, as Cowgate and in 1498 as Via Vaccarum. It is derived from the medieval practice of herding cattle down the street on market days; a number of other streets in the old town of Edinburgh (such as Grassmarket and Lawnmarket) also reflect their market roots. Gate is a Scots language word for "way" or "road", a cognate of similar words in other Germanic languages (compare with gait). Describing the street in the 1581 edition of their atlas of major cities Civitates orbis terrarum, Georg Braun and Frans Hogenberg said the Cow Gate was where "...the noble families and city councillors have their residences, together with other princely houses and palaces most handsome to behold." Between the mid 18th and mid 20th centuries the Cowgate was a poor, often overcrowded slum area. In the 19th century it was home to much of the city's Irish immigrant community and nicknamed "Little Ireland". In the evening of 7 December 2002, a fire started above the Belle Angele nightclub off the Cowgate. It swept up through the eight storey structure to other buildings on Cowgate and above it on South Bridge. The complicated nature of the buildings, with narrow alleys and entrances from the same building onto streets at different heights, complicated efforts to fight the fire, and was later called a "rabbit warren" by Lothian and Borders Fire Brigade. It took more than a day for the fire, fought at its height by 19 fire crews, to be extinguished. 150 people were forced to flee the flames, but no lives were lost. The University of Edinburgh School of Informatics on South Bridge was badly damaged; the school was a pioneer in the study of artificial intelligence in the 1950s and one of the world's most comprehensive archival libraries in this field was destroyed by the fire. Little current research data was lost in the fire due to offsite backups. In 2005 work began on a new building, the Informatics Forum, which was occupied mid-2008. Also destroyed was the Gilded Balloon, a major venue for the Edinburgh Fringe, and offices for both the Gilded Balloon and Underbelly venues housed in an 1823 listed warehouse by Thomas Hamilton. The Gilded Balloon later moved to premises in Teviot Row House. The First Minister of Scotland appealed to the UNESCO World Heritage Fund for money to assist in the redevelopment of the site. The site has been temporarily used as a Fringe venue again, becoming the C venues' Urban Garden during the 2007 and 2008 Festival. The gap site was acquired by the property developer Whiteburn, who were granted planning permission in January 2009 to build a new mixed-use development using the site and existing adjacent buildings. Construction began in 2012 and was completed in late 2013. The main components of the development are a small Sainsbury's supermarket, a 259-bed Ibis Hotel, shops, restaurants, a nightclub and a vennel. In 2016, protesters (including local homeless people) camped out in Cowgate to prevent the building of luxury hotel by Jansons Property. The protesters argued that the development might damage Edinburgh's UNESCO status, would displace homeless people, would remove a medical facility for the homeless and would block the natural light of the Edinburgh Central Library. MSP Andy Wightman offered his support to the campaign. The oldest building lies to the west end, but is sandwiched between other larger buildings and easily missed. It stands on the south side of the street, just west of where George IV Bridge crosses over the Cowgate. This is the Magdalen Chapel, a 16th-century almshouse chapel built with monies left by Michael MacQueen in 1537. Work was completed in 1544 and it operated as a hospital almshouse (dedicated to Mary Magdalen) under the control of MacQueen's widow, Janet Rynd until her death in 1553, when it passed to the Incorporation of Hammermen (metalworkers). The entrance as seen from the Cowgate was rebuilt in 1613. The spire was added in 1620. St Cecilia's Hall by Robert Mylne was built for the Musical Society of Edinburgh in 1763. It now houses a small Georgian concert space and an important collection of early keyboard instruments owned by Edinburgh University. St. Patrick's Roman Catholic Church stands at the east end of the Cowgate. It dates from 1772 but was extensively remodelled in 1929 following demolition of the tenements along the north side of the Cowgate which previously obscured its frontage. Both the National Library of Scotland and the Edinburgh Central Library have their lower floors on the Cowgate, with public access being on George IV Bridge above. Janet Boyman, executed for witchcraft on 29 December 1572; court documents record her home as the Cowgate. 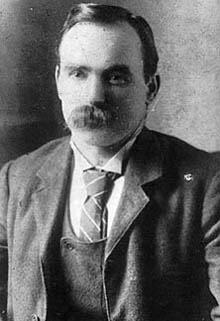 James Connolly, Irish revolutionary was born in 1868 at number 107 Cowgate. Football club Hibernian F.C. was founded by congregants of St Patrick's Roman Catholic Church in the Cowgate in August 1875 - the club was based at St Patrick's until the early 1890s, and cups the club won from this period are still displayed in the church. Canon John Gray, poet and priest was a curate at St. Patrick's. Venerable Margaret Sinclair lived at Blackfriars Street, just off the Cowgate. ^ "Driving directions to Cowgate". Google. Retrieved 11 October 2013. ^ Dixon, Norman. "The Placenames of Midlothian" (PDF). Archived from the original (PDF) on 27 August 2011. Retrieved 23 February 2013. ^ John Goss (1991). Braun & Hogenberg's "The City Maps of Europe". p. 43. ISBN 1-85170-732-8. ^ a b Levenson, Samuel (1973). James Connolly: a biography. London: Martin Brian and O'Keeffe. p. 28. ISBN 9780856161308. ^ a b c Gerard Seenan (9 December 2002). "Fire devastates Edinburgh's Old Town". The Guardian. ^ "History of the Gilded Balloon". Gilded Balloon. Retrieved 28 October 2014. ^ "Transforming Edinburgh". Premier Construction Magazine. 6 June 2013. Retrieved 11 October 2013. ^ Phyllis Stephen (20 June 2013). "Road closures to allow Soco development to move ahead". The Edinburgh Reporter. Retrieved 11 October 2013. ^ "Protesters camp out in bid to hobble £65m Old Town hotel". www.edinburghnews.scotsman.com. Retrieved 18 December 2016. ^ Goodwin, Karin (8 September 2016). "Edinburgh's age of endarkenment: development is 'ripping heart from city'". The Guardian. ISSN 0261-3077. Retrieved 18 December 2016. ^ "Musical Instrument Museums Edinburgh". University of Edinburgh. Archived from the original on 16 March 2013. Retrieved 3 July 2013.